A circle of twelve five-pointed yellow stars on a blue field. The European Flag or Flag of Europe is an official symbol of two separate international organisations, the Council of Europe (CoE) and the European Union (EU). It consists of a circle of twelve five-pointed yellow (or) stars on a blue (azure) field. The flag was designed in 1955, and officially launched later that year by the Council of Europe as a symbol for the whole of Europe. The Council of Europe urged it to be adopted by other European organisations, and in 1985 the European Communities (EC) adopted it. The graphical specifications given by the EU in 1996 describe the design as: "On an azure field a circle of twelve golden mullets, their points not touching." According to graphical specifications published online by the Council of Europe in 2004, the flag is rectangular with 2:3 proportions: its fly (width) is one and a half times the length of its hoist (height). Twelve yellow stars are centred in a circle (the radius of which is a third of the length of the hoist) upon a blue background. All the stars are upright (one point straight up), have five points and are spaced equally, like the hour positions on the face of a clock. 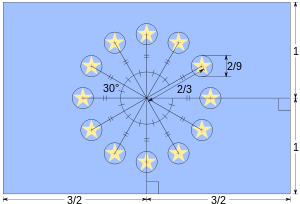 The diameter of each star is equal to one-ninth of the height of the hoist. The official symbolic description adopted by the EU omits the reference to the "Western world". The number of stars on the flag is fixed at twelve, representing "perfection and completeness" (in the original French: symbole de la perfection et de la plénitude). It is not related to the number of member states of the EU (although the EU happened to have 12 member states at the time of Maastricht Treaty). Prior to development of political institutions, flags representing Europe were limited to unification movements. The most popular were the European Movement's large green 'E' on a white background, and the "Pan European flag" of the Paneuropean Union (1922). The Council of Europe in 1950 appointed a committee to study the question of adopting a symbol. Numerous proposals were looked into. Among the unsuccessful proposals was the flag of Richard von Coudenhove-Kalergi's International Paneuropean Union, which he had himself recently adopted for the European Parliamentary Union. The design was a blue field with a red cross inside an orange circle at the centre. Kalergi was very committed to defending the cross as "the great symbol of Europe's moral unity", the red cross in particular being "recognized by the whole world, by Christian and non-Christian nations[,] as a symbol of international charity and of the brotherhood of man", but the proposal was rejected by Turkey (a member of the Council of Europe since 1949) on grounds of its religious associations in spite of Kalergi's suggestion of adding a crescent alongside the cross to overcome the Muslim objections. Other proposals included the flag was the European Movement, which had a large green E on a white background, a design was based on the Olympic rings, eight silver rings on a blue background, rejected due to the rings' similarity with "dial", "chain" and "zeros", or a large yellow star on a blue background, rejected due to its similarity with the so-called Burnet flag and the flag of the Belgian Congo. The Consultative Assembly narrowed their choice to two designs. One was by Salvador de Madariaga, the founder of the College of Europe, who suggested a constellation of stars on a blue background (positioned according to capital cities, with a large star for Strasbourg, the seat of the Council). He had circulated his flag round many European capitals and the concept had found favour. The second was a variant by Arsène Heitz, who worked for the Council's postal service and had submitted dozens of designs; the design of his that was accepted by the Assembly was similar to Salvador de Madariaga's, but rather than a constellation, the stars were arranged in a circle. In 1987, Heitz would claim that his inspiration had been the crown of twelve stars of the Woman of the Apocalypse, often found in Marian iconography (see below). On 25 September 1953, the Consultative Assembly of the Council of Europe recommended that a blue flag with fifteen gold stars be adopted as an emblem for the organisation, the number fifteen reflecting the number of states of the Council of Europe. West Germany objected to the fifteen-star design, as one of the members was Saar Protectorate, and to have its own star would imply sovereignty for the region. [better source needed] The Committee of Ministers (the Council's main decision making body) agreed with the Assembly that the flag should be a circle of stars, but opted for a fixed number of twelve stars, "representing perfection and entirety". The Parliamentary Assembly of the Council of Europe on 25 October 1955 agreed to this. Paul M. G. Lévy drew up the exact design of the new flag. Officially adopted on 8 December 1955, the flag was unveiled at the Château de la Muette in Paris on 13 December 1955. The European Parliament used its own flag from 1973, but never formally adopted it. It fell out of use with the adoption of the twelve-star flag by the Parliament in 1983. The flag followed the yellow and blue colour scheme however instead of twelve stars there were the letters EP and PE (initials of the European Parliament in the six community languages at the time) surrounded by a wreath. The June 1984 European Council (the Communities' leaders) summit in Fontainebleau stressed the importance of promoting a European image and identity to citizens and the world. The European Council appointed an ad hoc committee, named "Committee for 'a People's Europe'" (Adonnino Committee). This committee submitted a substantial report, including wide-ranging suggestions, from organising a "European lottery" to campaigning for the introduction of local voting rights for foreign nationals throughout Europe. Under the header of "strengthening of the Community's image and identity", the Committee suggested the introduction of "a flag and an emblem", recommending a design based on the Council of Europe flag, but with the addition of "a gold letter E" in the center of the circle of stars. The European Council held in Milan on 28/29 June 1985 largely followed the recommendations of the Adonnino Committee. But as the adoption of a flag was strongly reminiscent of a national flag representing statehood, was extremely controversial with some member states (in particular the United Kingdom), the Council of Europe's "flag of Europe" design was adopted only with the status of a "logo". The compromise was widely disregarded from the beginning, and the "European logo" in spite of the explicit avoidance of giving it the status of a "flag" was referred to as "Community flag" or even "European flag" from the outset. The flag of Europe flown alongside the Flag of France on Villa Schutzenberger, seat of the European Audiovisual Observatory, an institution within the Council of Europe (2011 photograph). The Communities began to use the "emblem" as its de facto flag from 1986, with it being raised outside the Berlaymont building (the seat of the European Commission) for the first time on 29 May 1986. The European Union, which was established by the Maastricht Treaty in 1992 to replace the European Communities and encompass its functions, has retained de facto use of the "Community logo" of the EC. Technically and officially, the "European flag" as used by the European Union remains not a "flag" but "a Community 'logo' — or 'emblem' — [...] eligible to be reproduced on rectangular pieces of fabric". In 1997, the "Central and Eastern Eurobarometer" poll included a section intending to "discover the level of public awareness of the European Union" in what were then candidate countries in Central and Eastern Europe. Interviewees were shown "a sticker of the European flag" and asked to identify it. Responses considered correct were: the European Union, the European Community, the Common Market, and "Europe in general". 52% of those interviewed gave one of the correct answers, 15% gave a wrong answer (naming another institution, such as NATO or the United Nations), and 35% could or would not identify it. In 2002, Dutch architect Rem Koolhaas designed a new flag, dubbed the "barcode", as it displayed the colours of the national flags of the EU member states in vertical stripes. It was never officially adopted by the EU or any organisation, but it was used as the logo of the Austrian EU Presidency in 2006. The official status of the emblem as the flag of the European Union was to be formalised as part of the Constitution of the European Union. However, as the proposed constitution failed ratification, the mention of all state-like emblems, including the flag, were removed from the replacement Treaty of Lisbon of 2007. Instead, a separate declaration by sixteen Member States was included in the final act of the Treaty of Lisbon stating that the flag, the anthem, the motto and the currency and Europe Day "will for them continue as symbols to express the sense of community of the people in the European Union and their allegiance to it." In September 2008, the Parliament's Committee on Constitutional Affairs proposed a formal change in the institution's rules of procedure to make "better use of the symbols". Specifically, the flag would be present in all meeting rooms (not just the hemicycle) and at all official events. The proposal was passed on 8 October 2008 by 503 votes to 96 (15 abstentions). In 2015, a set of commemorative Euro coin was issued on the occasion of the 30th anniversary of the adoption of the emblem by the European Communities. Ukrainian and EU flags at Euromaidan, December 2013. In April 2004, the European flag was flown on behalf of the European Space Agency, by Dutch astronaut André Kuipers while on board the International Space Station, in reference to the Framework Agreement establishing the legal basis for cooperation between the European Space Agency and the European Union. Following the 2004 Summer Olympics, President Romano Prodi expressed his hope "to see the EU Member State teams in Beijing [viz., the 2008 games] carry the flag of the European Union alongside their own national flag as a symbol of our unity". Use of the flag has also been reported as representing the European team at the Ryder Cup golf competition in the early 2000s, although most European participants preferred to use their own national flags. 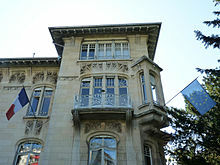 In Georgia, the flag was on most government buildings since the coming to power of Mikhail Saakashvili (2007), who used it during his inauguration, stating: "[the European] flag is Georgia's flag as well, as far as it embodies our civilisation, our culture, the essence of our history and perspective, and our vision for the future of Georgia." It was used in 2008 by pro-western Serbian voters ahead of an election. The flag became a symbol of European integration of Ukraine in the 2010s, particularly after Euromaidan. Ukraine is not a part of the EU but is a member of the Council of Europe. The flag is used by the Cabinet of Ukraine, Prime Minister of Ukraine, and MFA UA during official meetings. It was flown during the 2013 Euromaidan protests in Ukraine, and in 2016 by the pro-EU faction in the EU membership referendum campaigns in the United Kingdom. The flag has also been adopted as a symbol for EU policies and expansionism by EU-sceptics. In an early instance, the Macedonian protesters burned "the flag of the EU" in the context of EU involvement in the 2001 insurgency in the Republic of Macedonia. In the 2005 Islamic protests against the Jyllands-Posten Muhammad cartoons, the Danish flag was most frequently burned, but (as the cartoons were reprinted in many European countries), some protesters opted for burning "the EU flag" instead. Protesters during the Greek government-debt crisis of 2012 "burned the EU flag and shouted 'EU out' ". Burning of the EU flag has been reported from other anti-EU rallies since. By the 2010s, the association of the emblem with the EU had become so strong that the Council of Europe saw it necessary to design a new logo, to "avoid confusion", officially adopted in 2013. In 1987, following the adoption of the flag by the EC, Arsène Heitz (1908–1989), one of the designers who had submitted proposals for the flag's design, suggested a religious inspiration for it. He claimed that the circle of stars was based on the iconographic tradition of showing the Blessed Virgin Mary as the Woman of the Apocalypse, wearing a "crown of twelve stars". The French satirical magazine Le Canard enchaîné reacted to Heitz's statement with an article entitled L’Europe violée par la Sainte Vierge ("Europe Raped by the Blessed Virgin") in the edition of 20 December 1989. Heitz also made a connection to the date of the flag's adoption, 8 December 1955, coinciding with the Catholic Feast of the Immaculate Conception of the Blessed Virgin Mary. 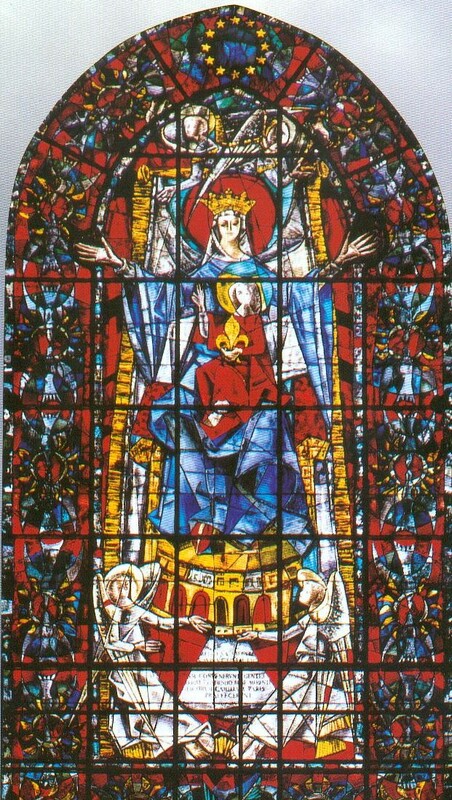 An article posted in La Raison in February 2000 further connected the donation of a stained glass window for Strasbourg Cathedral by the Council of Europe on 21 October 1956. This window, a work by Parisian master Max Ingrand, shows a blessing Madonna underneath a circle of 12 stars on dark blue ground. 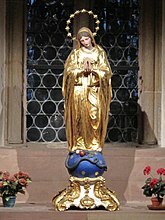 The overall design of the Madonna is inspired by the banner of the cathedral's Congrégation Mariale des Hommes, and the twelve stars are found on the statue venerated by this congregation inside the cathedral (twelve is also the number of members of the congregation's council). The Regional Office for Cultural Affairs describe this stained glass window called "Le vitrail de l'Europe de Max Ingrand" (The Glass Window of Europe of Max Ingrand). The EU emblem ("EU flag") is depicted on the euro banknotes. Euro coins also display circle of twelve stars on both the national and common sides. The EU uses the emblem in a number of ways, here on vehicle registration plates. The "D" in this photo indicates Germany (Deutschland). It is also depicted on many driving licences and vehicle registration plates issued in the Union. Diplomatic missions of EU member states fly the EU flag alongside their national flag. In October 2000, the then-new British Embassy in Berlin sparked controversy between the UK and Germany and the EU when the embassy did not have a second external flagpole for the EU flag. After diplomatic negotiations, it was agreed that the outside flagpole would have the Union Flag while inside the embassy, the EU flag would accompany the UK flag. A number of logos used by EU institutions, bodies and agencies are derived from the design and colours of the EU emblem. 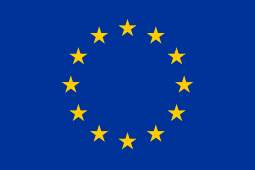 Other emblems make reference to the European flag, such as the EU organic food label that uses the twelve stars but reorders them into the shape of a leaf on a green background. The original logo of the European Broadcasting Union used the twelve stars on a blue background adding ray beams to connect the countries. There was a proposal in 2003 to deface national civil ensigns with the EU emblem. The proposal was rejected by Parliament in 2004. The flag is usually flown by the government of the country holding the rotating presidency Council of Ministers. In 2009, Czech President Václav Klaus, a eurosceptic, refused to fly the flag from his castle. In response, Greenpeace projected an image of the flag onto the castle and attempted to fly the flag from the building themselves. Extraordinary flying of the flag is common on Europe Day, celebrated annually on 9 May. On Europe Day 2008, the flag was flown for the first time above the German Reichstag. The flag has also been displayed in the context of EU military operations (EUFOR Althea). Order of precedence at the state visit of Greek prime minister Antonis Samaras in Berlin (24 August 2012): The Greek flag takes the first order of precedence, followed by the German flag on the right (seen on the left when facing the building) and the European flag in third order, on the left. Sixteen out of twenty-seven member states in 2007 signed the declaration recognizing "the flag with a circle of twelve golden stars on a blue background" as representing "the sense of community of the people in the European Union and their allegiance to it." In 2017, president of France Emmanuel Macron signed a declaration endorsing the 2007 statement, so that, as of 2018, 17 out of 28 members have recognized the emblem as a flag representing "allegiance to the EU": Austria, Belgium, Bulgaria, Cyprus, France, Germany, Greece, Hungary, Italy, Lithuania, Luxemburg, Malta, Portugal, Romania, Slovakia, Slovenia and Spain. Italy has incorporated the EU flag into its flag code. According to an Italian law passed in 2000, it is mandatory for most public offices and buildings to hoist the European Flag alongside the Italian national flag (Law 22/1998 and Presidential Decree 121/2000). Outside official use, the flag may not be used for "aims incompatible with European values". The 2000 Italian flag code expressly replaces the Italian flag with the European flag in precedence when dignitaries from other EU countries visit – for example the EU flag would be in the middle of a group of three flags rather than the Italian flag. In Germany, the federal flag code of 1996 is only concerned with the German flag, but some of the states have legislated additional provisions for the European flag, such as Bavaria in its flag regulation of 2001, which mandates that the European flag take the third order of precedence, after the federal and state flags, except on Europe Day, where it is to take the first order of precedence. In Ireland and the United Kingdom, on occasions of "European Union Events" (for example, at a European Council meeting), where the European flag is flown alongside all national flags of member states, the national flags are placed in alphabetical order (according to their name in the main language of that state) with the European flag either at the head, or the far-right, of the order of flags. In most member states, use of the EU flag is only de facto and not regulated by legislation, and as such subject to ad hoc revision. In national usage, national protocol usually[clarification needed] demands the national flag takes precedence over the European flag (which is usually displayed to the right of the national flag from the observer's perspective). In November 2014, the speaker of the Hungarian Parliament László Kövér ordered the removal of the EU flag from the parliament building, following an incident in which a member of parliament had "defenestrated" two EU flags from a fourth story window. In November 2015, the newly-elected Polish government under Beata Szydło removed the EU flag from government press conferences. The flag of Bosnia and Herzegovina, imposed by High Representative Carlos Westendorp, after the country's parliament failed to agree on a design, is reminiscent of the symbolism of the EU flag, using the same blue and yellow colours, and the stars, although of a different number and colour, are a direct reference to those of the European flag. Likewise, Kosovo uses blue, yellow and stars in its flag, which has been mocked as "a none too subtle nod to the flag of the European Union, which is about to become Kosovo's new best friend as it takes over protector status from the United Nations". The blue and yellow colours of the Brussels flag are those of the European Union, of which Brussels is the de facto capital city. The flag of the Brussels-Capital Region (introduced in 2016) consists of a yellow iris with a white outline upon a blue background. Its colours are based on the colours of the Flag of Europe, because Brussels is considered the unofficial capital of the EU. ^ The name "flag of the European Union" is used in e.g. the Italian law no. 22 of 5 February 1998 (bandiera dell'Unione europea), and by the Centre virtuel de la connaissance sur l'Europe (Le drapeau de l'Union européenne, 2016). ^ a b "Romania slams Moldova's sanctions". News.bbc.co.uk. 9 April 2009. Retrieved 12 December 2017. ^ a b Graphical specifications for the European flag, Council of Europe, archived from the original on 12 June 2004 "PANTONE REFLEX BLUE corresponds in the web-palette colour RGB:0/0/153 (hexadecimal: 000099) and PANTONE YELLOW corresponds in the web-palette colour RGB:255/204/0 (hexadecimal: FFCC00)." ^ a b (in French) Guide graphique relatif à l'emblème européen (1996), p. 6: Le jaune est obtenu avec 100% de «Process Yellow». En mélangeant 100% de «Process Cyan» avec 80% de «Process Magenta», on obtient un bleu très semblable au Reflex Blue Pantone. ^ a b Council of Europe’s new visual identity- Guide, Council of EUrope, 2013. ^ a b RGB and CMYK values are those given in the 2013 recommendation. Pantone recommendations for PMS 287: RGB #003087, CMYK 100.75.2.18 (pantone.com); for PMS 116: RGB #FFCD00, CMYK 0.14.100.0 (pantone.com). ^ Sache, Ivan (17 July 2004). "Number of stars on the flag of the European Union". Retrieved 7 July 2010. ^ a b "European Union Flag : University of Dayton, Ohio". udayton.edu. Retrieved 20 February 2019. ^ Final Act, Official Journal of the European Union, 2007 C 306–2, p. 267 Declaration 52, consolidated EU treaties. ^ "EU Parliament set to use European flag, anthem". EU Business. 11 September 2008. Archived from the original on 12 September 2008. Retrieved 12 September 2008. The proposal was passed on 8 October 2008 by 503 votes to 96 (15 abstentions). Kubosova, Lucia (9 October 2008). "No prolonged mandate for Barroso, MEPs warn". EUobserver. Retrieved 9 October 2008. ^ (in French) Letter to the secretary general of the Council of Europe from Richard Coudenhove-Kalergi, Council of Europe. ^ Johan Fornäs, Signifying Europe (2012), p. 131. ^ (in French) Letter from Richard Coudenhove-Kalergi regarding a Muslim modification to the Pan-Europa flag design, Council of Europe. ^ a b c "Real politics, at last?". The Economist. 28 October 2004. Retrieved 14 August 2011. ^ a b Regarding The "Adonnino Report" - Report to the European Council by the ad hoc committee "On a People's Europe", A 10.04 COM 85, SN/2536/3/85. ^ "bearing in mind the independence and the different nature of the two organizations, the Committee proposes to the European Concil that the European Community emblem and flag should be a blue rectangle with, in the center, a circle of twelve five-pointed gold stars which do not touch, surrounding a gold letter E, of the design already used by the Commission." Adonnino Report, p. 31. ^ Tobias Theiler, Political Symbolism and European Integration, Manchester University Press, 2005 p. 61–65. ^ "not a compromise that the Commission itself cared much to abide by: from the outset, it generally used the terms 'Community flag' or, bolder still, 'European flag'." Tobias Theiler, Political Symbolism and European Integration, Manchester University Press, 2005 p. 6. ^ Nicole Scicluna, European Union Constitutionalism in Crisis, Routledge (2014), p. 56. ^ Countries polled: Czech Republic, Estonia, Hungary, Latvia, Lithuania, Poland, Slovakia, Slovenia (joined 2004), Bulgaria and Romania (joined 2007). Central and Eastern Eurobarometer, Issue 8, European Commission, March 1998. ^ Olympic Games 2004 – Congratulations from President Prodi, European Commission, 30 August 2004. ^ Grätz, Jonas (9 December 2013). "Revolution on Euromaidan". Foreign Affairs. ISSN 0015-7120. Retrieved 3 April 2018. ^ "Politics of brutal pressure". The Economist. 23 November 2013. Archived from the original on 25 December 2016. ^ "The Evolution Of Euromaidan". Radio Free Europe/Radio Liberty. 19 November 2014. Archived from the original on 3 April 2018. ^ The Times 27 June 2001, p. 14, cited after Ian Jeffries, The Former Yugoslavia at the Turn of the Twenty-First Century: A Guide to the Economies in Transition, Routledge (2003), p. 296. ^ G. Delanty in: David Denney (ed. ), Living in Dangerous Times: Fear, Insecurity, Risk and Social Policy (2009), p. 124. ^ Blaming Sara B. Hobolt, James Tilley, Europe? : Responsibility Without Accountability in the European Union (2014), p. 3. ^ e.g. Peach protest: Spanish farmers burn EU flag in anger over Russia sanctions war, RT, 22 August 2014; Jess Casey, Cork group burns flag during anti-EU rally outside City Hall, Evening Echo, 10 May 2017; Chloe Kerr, Furious protesters BURN EU flags in chaos across Sofia after Juncker visits Bulgaria, Express, 12 January 2018. ^ a b c Carlo Curti Gialdino, I Simboli dell'Unione europea, Bandiera - Inno - Motto - Moneta - Giornata. Roma: Istituto Poligrafico e Zecca dello Stato S.p.A., 2005. ISBN 88-240-2503-X, pp. 80–85. Gialdino is here cited after a translation of the Italian text published by the Centre Virtuel de la Connaissance sur l'Europe (cvce.eu): "Irrespective of the statements by Paul M. G. Levy and the recent reconstruction by Susan Hood, crediting Arsène Heitz with the original design still seems to me the soundest option. In particular, Arsène Heitz himself, in 1987, laid claim to his own role in designing the flag and to its religious inspiration when he said that 'the flag of Europe is the flag of Our Lady' [Magnificat magazine, 1987]. "Secondly, it is worth noting the testimony of Father Pierre Caillon, who refers to a meeting with Arsène Heitz. Caillon tells of having met the former Council of Europe employee by chance in August 1987 at Lisieux in front of the Carmelite monastery. It was Heitz who stopped him and declared 'I was the one who designed the European flag. I suddenly had the idea of putting the 12 stars of the Miraculous Medal of the Rue du Bac on a blue field. My proposal was adopted unanimously on 8 December 1955, the Feast of the Immaculate Conception. I am telling you this, Father, because you are wearing the little blue cross of the Blue Army of Our Lady of Fatima'". ^ European Union: Myths on the flag, Flags of the World, 2002 , retrieved 4 August 2007 "While Count Coudenhove-Kalergi in a personal statement maintained that three leading Catholics within the Council had subconsciously chosen the twelve stars on the model of Apocalypse 12:1, Paul M.G. Lévy, Press Officer of the Council from 1949 to 1966, explained in 1989 that there was no religious intention whatsoever associated with the choice of the circle of twelve stars." Peter Diem, 11 June 2002. ^ (in German) Pinzka, Thomas (26 August 1998). "Der Sternenkranz ist die Folge eines Gelübdes" [The crown of stars is the result of a vote]. Die Welt. Retrieved 3 November 2018. ^ "Meeting of the EUROPEAN COUNCIL held on 19 October 2017". European Council. 17 January 2018. Retrieved 3 February 2018. EDER, FLORIAN (19 October 2017). "Manu joins EU flag club". Retrieved 3 November 2017. Cross, Tony (20 October 2017). "Macron squares up to Eurosceptics on EU flag, Brexit". Retrieved 3 November 2017. ^ The Rules of Protocol regarding national holidays and the use of the Italian flag (2001) Archived 19 December 2008 at the Wayback Machine Presidency of the Council of Ministers, Department of Protocol (2001). LAW No. 22 of 5 February 1998: "GENERAL RULES GOVERNING THE USE OF THE FLAGS OF THE ITALIAN REPUBLIC AND THE EUROPEAN UNION". ^ FlaggAO (BGBl. I S. 1729) 13. November 1996. ^ Flaggen-Verwaltungsanordnung (VwAoFlag) in der Fassung der Bekanntmachung vom 4. Dezember 2001 "§ 3 (1) Grundsätzlich werden die bayerische Staatsflagge, die Bundesflagge und, soweit möglich, die Europaflagge gemeinsam gesetzt. (2) 1 Der Bundesflagge gebührt die bevorzugte Stelle. 2 Sie ist grundsätzlich in der Mitte zu setzen, rechts anschließend, vom Innern des Gebäudes mit dem Blick zur Straße gesehen, die bayerische Staatsflagge und links die Europaflagge. 3 Am Europatag ist die Europaflagge an bevorzugter Stelle zu hissen." ^ President of Hungarian parliament orders removal of EU flag, The Budapest Beacon 17 November 2014. ^ a b "Kosovo's fiddly new flag", The Economist, 18 February 2008, retrieved 11 February 2009 Quetteville, Harry de (19 February 2008). "Kosovo will need more than a new flag". Telegraph.co.uk. Retrieved 12 December 2017. "flag of Kosovo". Britannica.com. Retrieved 12 December 2017. ^ "Western European Union". Flags of the World. Retrieved 11 February 2009. ^ a b (in Dutch) "Gewest gaat voor nieuwe vlag met hartjeslogo" [Region goes for new flag with hearts logo]. brusselsnieuws.be. Brussels. 17 December 2014. Retrieved 1 January 2015. ^ (in French) "Un nouveau look pour la région Bruxelles-capitale". brusselslife.be. Retrieved 23 December 2016. [Sander Vermeulen ajoute :] "Quant aux couleurs, elles rappellent celles du drapeau de l’Union européenne dont Bruxelles est la Capitale"